December | 2017 | What Next? During the Christmas season my church has included a prayer of confession in each of our services. I am leading worship today. This is the confession I wrote for the service this morning. My sister and brother and I with our grandmother. Imagine Having A Memory Like That at 88 ! 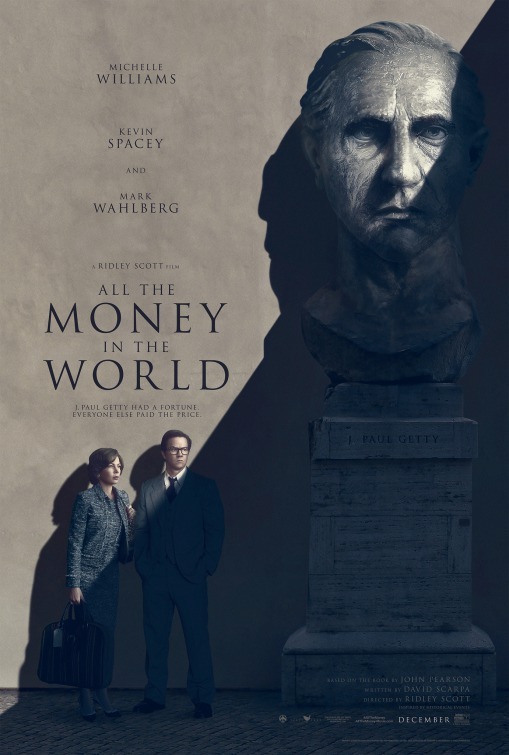 We went to see the movie All the Money in the World. It tells the story of the kidnapping in 1973 of J.P. Getty’s grandson and namesake. The senior Getty was at the time one of the richest men in the whole world but refused to pay his grandson’s ransom. The movie certainly makes the point that all the money in the world can’t make you happy, or buy you love or respect. It shows how in the end the accumulation of things leaves one cold and lonely. 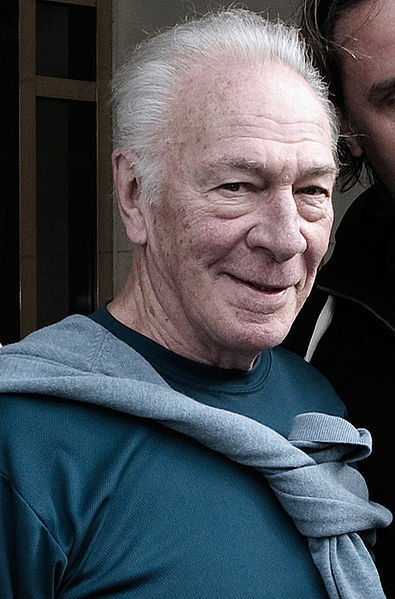 What I admired most about the film however was Christopher Plummer’s performance. At age 88 he was called in after the entire movie had been shot to play the part of J.P. Getty because Kevin Spacey, the man who had filled the starring role had been accused of inappropriate sexual behavior. In just nine days all the scenes with Spacey had to be filmed again with Plummer in his place. It wasn’t until I saw the film that I truly realized what a feat that was. Plummer’s part was HUGE! The number of lines he had to learn in short order is amazing. At 88 he claimed it wasn’t that hard. After years of memorizing scripts he’s become quite adept at it. Plummer memorized the longest sections first and then worked his way down to the shorter ones. It made me wonder if I shouldn’t take up drama in my old age if it helps you retain such a remarkable memory. I think many octogenarians would give an awful lot of money, though perhaps not all the money in the world, for a memory like that! In November I heard Anna Maria Tremente interview Rachel Jeffs on the CBC radio program The Current. Rachel, a former member of the Fundamentalist Church of Latter Day Saints has written a book called Breaking Free and Anna Maria was talking to Rachel about the story she shares in that book. I purchased the book last week and read it quickly, partly because the story was so troubling I wanted to get it finished. Rachel’s life experience demonstrates how easily religion can be used as a tool to imprison people. 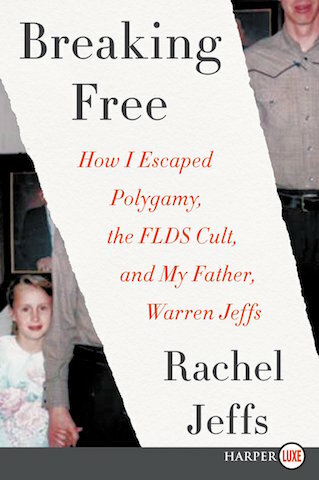 Rachel experienced love and care and support in her FLDS homes from her siblings and mothers but she was also at the mercy of her mentally unstable father Warren Jeffs, who was the prophet or leader of the FLDS movement and had to be obeyed unquestioningly. Warren had 70 wives some of them as young as twelve. Her father began sexually abusing Rachel when she was eight. When Rachel was eighteen her father arranged for her to marry a FLDS man who already had two other wives. Rachel’s father was arrested in 2008 for aggrevated sexual assault and imprisoned for life but he continues to run his religious empire from his prison cell. 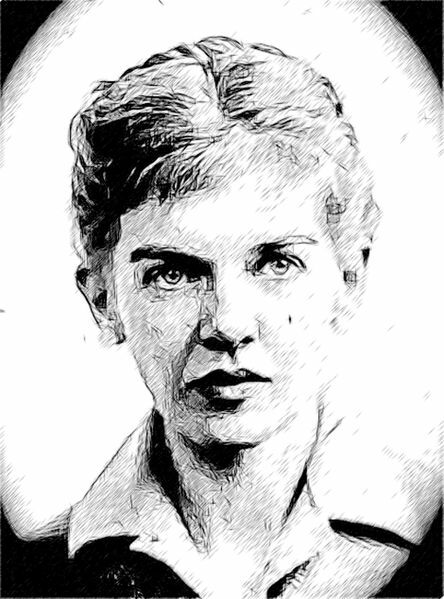 It was his edicts from prison that forced Rachel to be separated from her own children for months at a time and the last time her father issued an order that she be put into isolation, Rachel knew she had to flee her FLDS faith family in order to protect her children. One wonders why nothing can be done to break up this religious group. But its members have been so brainwashed they believe the imprisoned Jeffs must be followed blindly if they want to acheive eternal salvation. That makes them prisoners too and is why their group continues to exist. I think part of what is so unsettling about this story is that it makes me think about the dangerous and destructive behaviors of my own church in the past, forcing women to be submissive by not allowing them to assume any sort of leadership, pastors using their power over women to take sexual advantage, congregations ostracizing LGBTQ people and saying they must change to part of the church, and scaring children into obeying by telling them if they don’t they will go to hell. That’s a troubling legacy as well. Stories like Rachel’s remind us that religion can be used for both good and evil and the line is never as black and white as we might think. One of my favorite pages in Macleans magazine was the last one called The End. It featured the obituary of an interesting Canadian, not a famous Canadian, but one who had lived their life in a special way. Macleans will no longer publish the beloved feature. As a kind of farewell for The End writer Michael Friscolanti read twelve years worth of obituaries and made a short list of life lessons gleaned from other peoples’ lives. Find love. It is life’s greatest privilege and reward. Be yourself. Follow your own path. My niece climbing a steep path on her own on a Arizona hike. 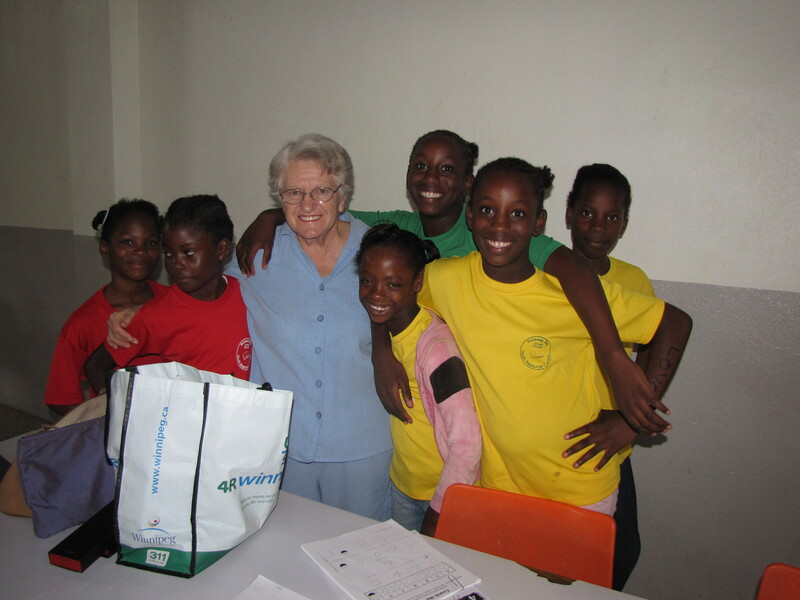 My Mom dealt with severe health problems for many years but remained our greatest cheerleader till her dying day. Good advice from people who lived their legacy. 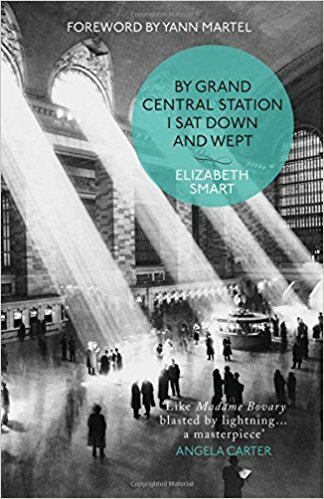 Those quotes are from Canadian author Elizabeth Smart’s book By Grand Central Station I Sat Down And Wept. I read the book to prepare for attending an upcoming concert by Heavy Bell a Winnipeg music duo composed of Tom Keenan and Matt Peters. They collaborated on last year’s award-winning musical version of Shakespeare’s Richard II directed by Christopher Brauer. 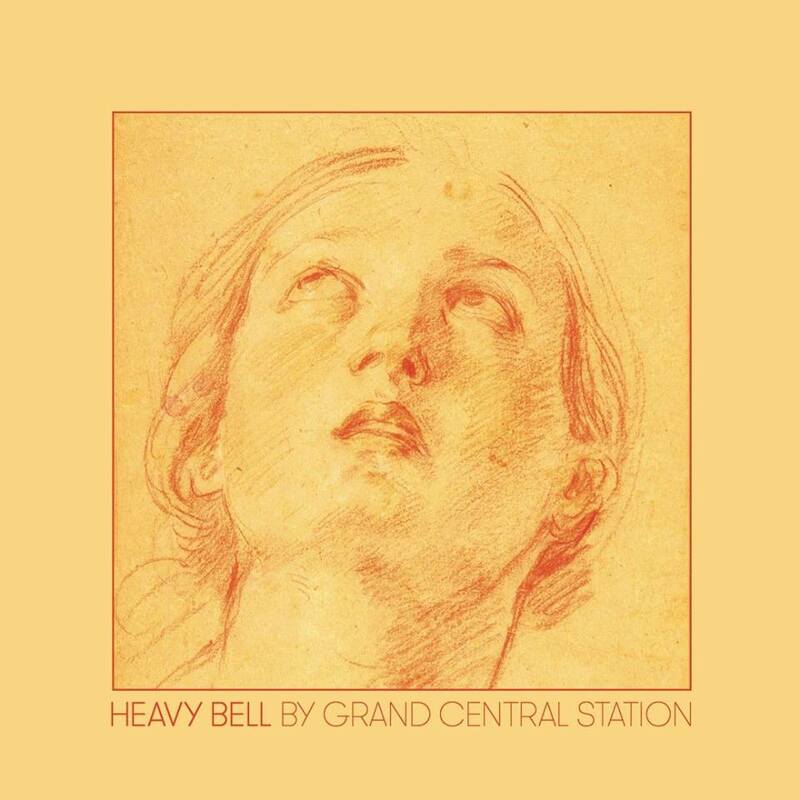 Now Keenan and Peters have written and recorded a song cycle based on By Grand Central Station I Sat Down and Wept. They will perform it on January 13 at the West End Cultural Centre. I am looking forward to the performance because the lush and lovely language of Elizabeth’s book fairly sings itself off the page and I can see how its poetic images especially those related to nature would make beautiful music. In her book Elizabeth is describing a decades long affair she had with poet George Barker. To say she was besotted with George is to do her a disservice. She was passionately in love with him. Although they never married he was her very life’s breath. Smart and Barker’s son Christopher says his father always remained a Christ-like figure to his mother. There are many poetic Biblical references in By Grand Central Station I Lay Down and Wept and these too will lend themselves well to music. The very title of the book alludes to Psalm 137:1 “By the waters of Babylon we sat down and wept.” Ms. Smart quotes extensively from the Song of Solomon. I am certainly excited about hearing the musical version of By Grand Central Station I Sat Down and Wept. I am sure I will appreciate the concert on January 13 even more now that I’ve read the literary prose it on which it is based. But I am also glad I read Elizabeth Smart’s book because it raised lots of good questions for me about my ideas about love and life. I’ll address those in another post. This beautiful Christmas card features a landscape painted by our friend Don Hoeppner. Don is a talented artist. You can see more of his paintings here. We don’t get nearly as many Christmas cards as we once did. I admit we don’t send any out ourselves anymore. But some of the ones we did get, like the one above from Don and his wife Marlene are real works of art. The ornaments on this card are handpainted water colors by my friend Esther. She also wrote a poem inside about the friendship we share. This was the card I received from the education department leaders at the Winnipeg Art Gallery where I am employed. It features a linocut stencil that is one of the earliest Inuit prints. Jospeh Pootoogook from Cape Dorset did the drawing in 1958 and his son Kananginak made the print. This car was created by my friend Debbie. She works at a scrapbooking and craft supply store and used different kinds of papers and lettering to design this beautiful card. Christmas cards are losing popularity as more and more people send their holiday greetings to one another via the internet. I am glad we still get a few real cards. Some of them are true works of art! I’ve spent Christmas in many different places. In 2008 we spent Christmas Day hiking the Wai -O- Tapu Thermal Fields in New Zealand. 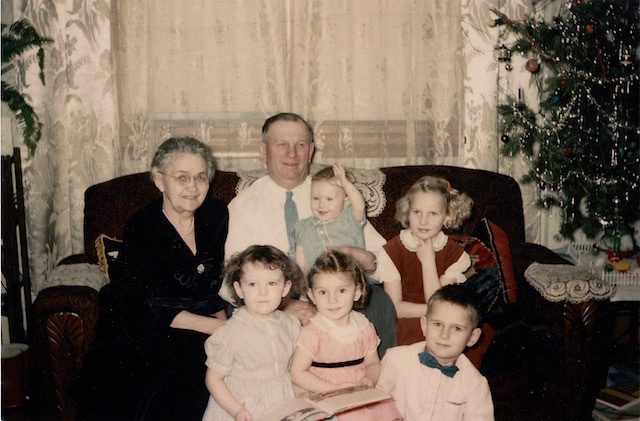 As a child my Christmas always included time spent with my cousins at my grandparents’ home in Gnadenthal, Manitoba. I spent Christmas Day in 2010 drinking beer and eating pretzels in Germany. In 1959 at Christmas my family was living in a residence for medical interns at the St. Boniface Hospital and the nuns there staged a Christmas party for the intern’s children. A number of my Christmases between 2003 and 2011 were spent in Hong Kong. 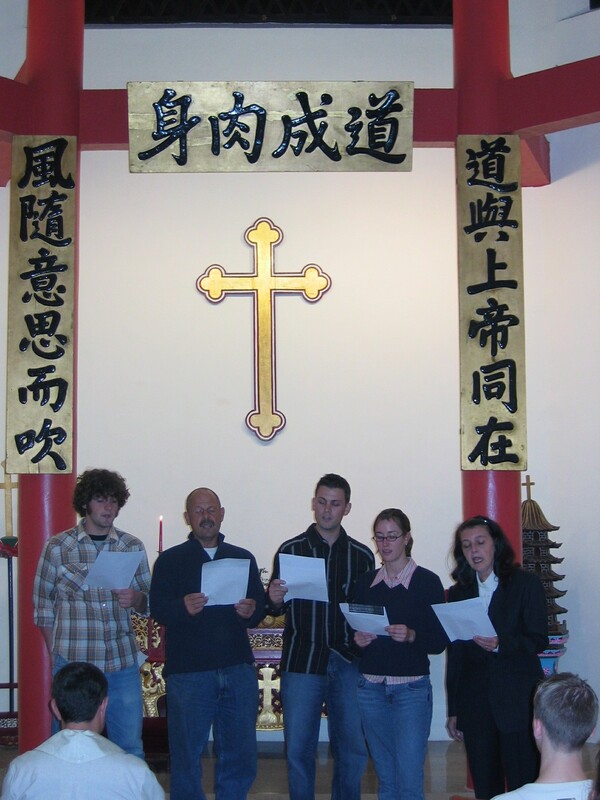 Here we are singing Lo How a Rose Ere Blooming with our children in our Hong Kong church on Christmas Eve in 2004. Many of my childhood Christmases were spent in Saskatchewan at my maternal grandparents’ homes in Drake. 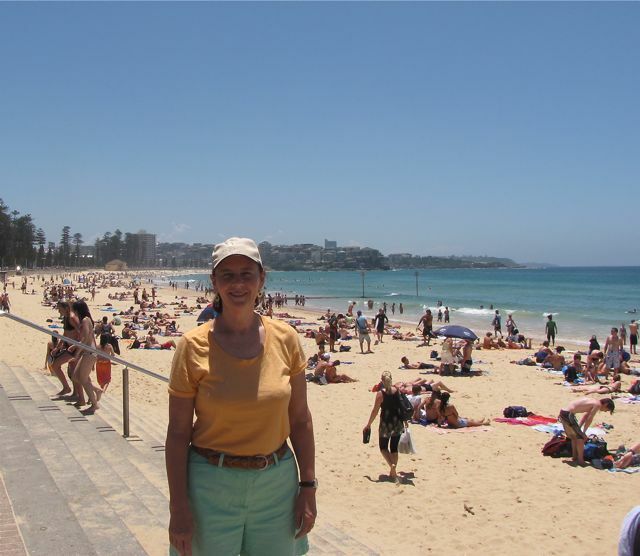 I spent Christmas Day in 2009 on the beach in Sydney Australia. 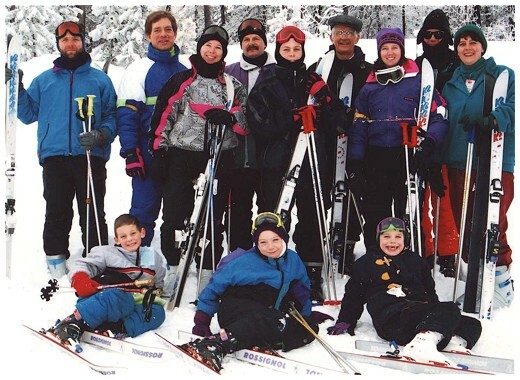 In the early 1990s we spent one Christmas in Red Deer Alberta at my brother and sister-in- law’s home and went on a family ski trip in Banff. 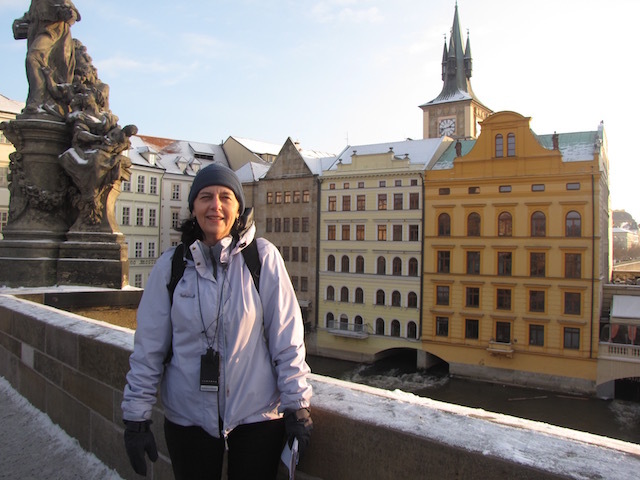 Here I am freezing in Prague one Christmas. We have spent many Christmases in Steinbach at my parents’ home. 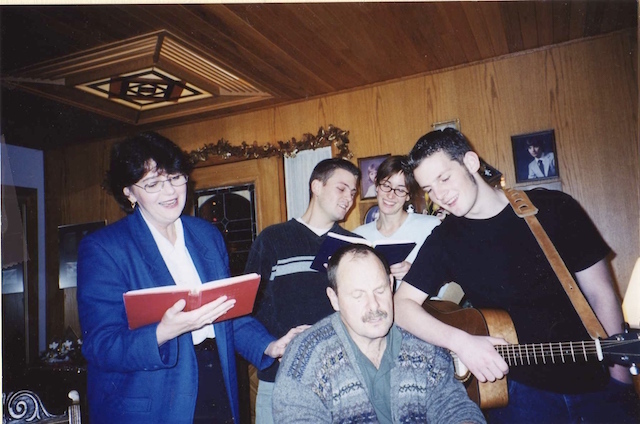 Here we are singing as a family at Mom and Dad’s house on their country property just outside of Steinbach. 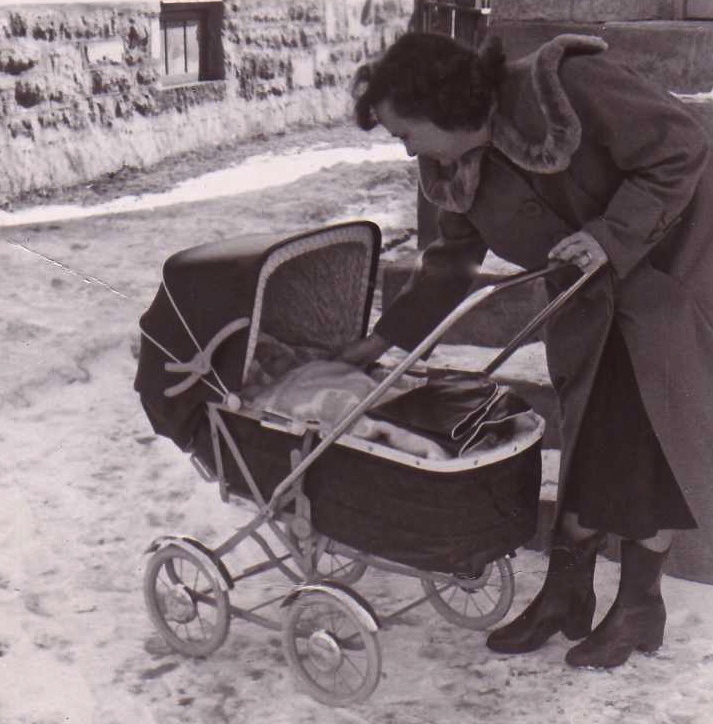 I spent my very first Christmas in Winnipeg because that is where I was born. Here’s my Mom taking me out for a walk. Winnipeg is also where I will spend this Christmas. I am going to take a two day break from blogging now. Wishing all my blog readers a very Merry Christmas.